The opening of our fifth Village draws nearer and we’re ticking off milestones at rapid pace. The first Lodge is complete! This is one marker we wanted to shout about – as the build has now reached the exciting point where we can reveal the first fully furnished lodge. 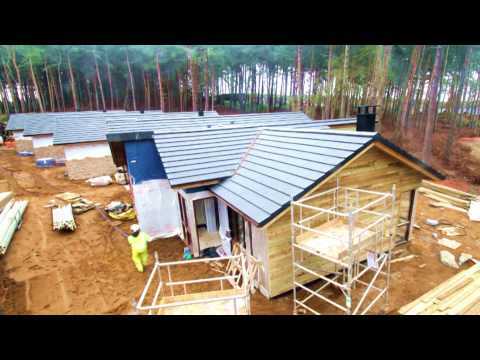 To mark the completion of this ready-to-live-in lodge at Woburn Forest, we’ve created a time-lapse film to give you an exclusive insight into how it was built. The film shows the entire construction process, from foundations and wall panel installations, to interior fit out of the recently completed accommodation. The Woodland Lodge is the first of 625 at the Village to be completed ahead of the opening this spring. During the fit-out on the remaining lodges, we will be laying out 634 rugs, hanging 625 chalk boards, fluffing 7,348 pillows and 6,356 cushions, as well as placing 1,875 board games inside for families to enjoy. Guests can now book summer breaks at Woburn Forest. Spring breaks are soon to be released. Where can I find plans of the various villa layouts ? To see Woburn-specific floor plans, you will need to carry out an accommodationavailability search here: http://www.centerparcs.co.uk/makeabooking/index.jsp on a specific date, then click on the accommodation for more information. Hope that helps! Since becoming the Woburn Forest Press Officer in 2012 I have had the privilege of spreading the word on our fifth Village, from the planning, construction and recruitment to the nature, local engagement and operations. Get the latest on Woburn Forest with my monthly updates.